Here's a picture Billy took (thank you for fussing so much to get this just right even though I was non-plussed and irritated at the time by it Billy!) of some of the treasures I received yesterday at the mother and baby welcoming party that Liz and Suzanne threw for me. It was the best party I've ever been to because there was so much love and it was a great bunch of women sitting around telling sweet, touching, and even hilarious stories about life, and being women and mothers. Plus GREAT food and fun crafting- I was in heaven. In the foreground you can see some of the beads that people gave me. They each brought one and I strung them together while they each told a story about mothers. And the finished product is a beautiful necklace that I can bring to labor to remember all the love and stories from them all. So lovely an idea and finished product! Some of the funky beads, like the yellow one and the blue and black one were MADE by my brother Khalil for my mom and sister to give to me. Many of them were donated by Janie from her amazing bead collection and I took them all home and strung them together over again with all the extras from her and with a clear bead in between each of them so they would stand out a little more. She and Liz had also picked out one each for Maya and Georgia that remind them of their personalities, and the girls were thrilled to get them. They live now in their own personal treasure boxes. The light brown box contains little messages on gorgeous paper from all the women there, saying what acts of service they are prepared to render our family when the baby is born. That is so precious and really the perfect gift for me. To be able to look at that box and see it's overflowing offers of help when I need it releives a whole category of anxiety that I have about how the whole transition is going to go. It's love therapy. The dark brown treasure chest is filled with prayer bundles that we each made at the party for Teresa. 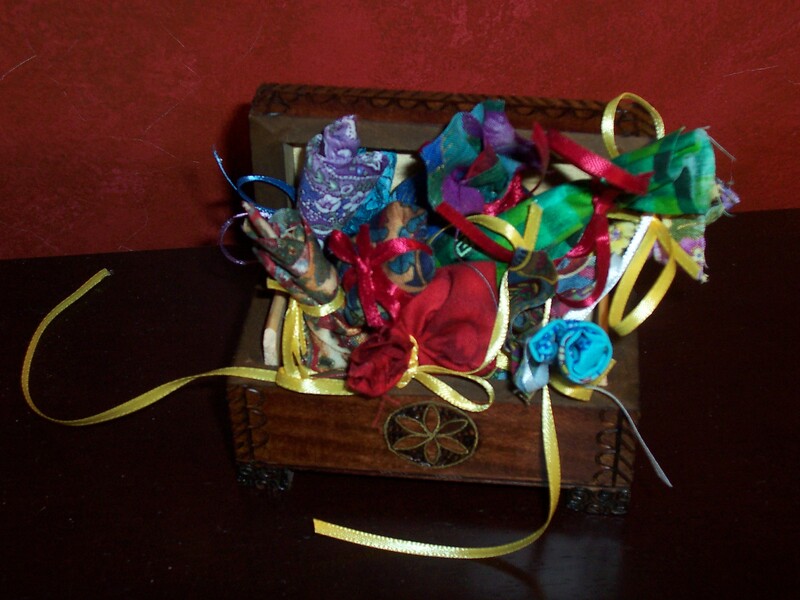 They contain rose petals, rose oil, and a prayer whispered into each one, then wrapped up tight. What a bountiful blessing she has gotten. She's living up to her name, which means harvester, already. And for a person to have a gift like this that they can keep their whole lives is amazing. She's being boosted onto the shoulders of these great women in a spiritual sense. How high she'll be able to climb, and how far she'll be able to see! Thank you thank you all you wonderful people for throwing such a meaningful and amazing party for us! I love you! Bahiyyih, I check your blog every day to see if you've gone into labor yet!--Not that you should worry (or even think about posting during that time), but I do check just in case. I can't wait! Me, too! I found a message on my phone after I got out of the Teen Mom's volunteering thing I do last night and I thought that I would wait to check it until after 9 PM, when our evening minutes begin, but then I noticed that it was from you and so I checked right away!! No baby yet, but what was the Hobby Lobby excursion like? We had our third annual post Valentine's day sale excursion to Hobby Lobby to pick up heart-ish things for Ayyam-i-Ha and gift wrapping, etc. We also got Georgia a paint by number and Maya a LARGE bottle of red glitter glue. That all kept them busy for about 1 hour this morning. These kids are voracious with the crafting! Yes, Lucy goes through tape dispensers in minutes - can't keep up with her!